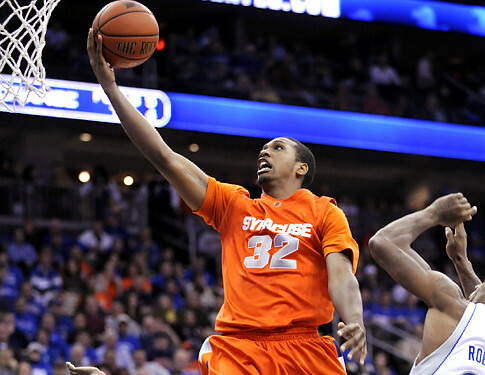 Kris Joseph was a forward at Syracuse University. He was a quiet player on the court with an excellent ability to drive to the hoop. Joseph started his freshman year as one of the main reserves rotated into each game. He showed the ability to cut to the hoop, and provide some speed when needed, and even started two games when Paul Harris was injured. However, when Syracuse started playing the tougher teams in the Big East, Joseph's rebounding totals dropped significantly, and his playing time suffered for the remainder of the season. Joseph emerged as a star sixth man his sophomore season. Though he came off the bench, he would play 'starters minutes' with about 27 minutes a game. His slashing style driving to the hoop made him a valuable offensive option anytime he entered the game, and he provided solid rebounding and defense along with the occasional spectacular dunk, allowing big men Rick Jackson and Arinze Onuaku to take breaks in the game. Joseph was recognized as the Big East Sixth Man of the Year. Syracuse fans had big expectations for Joseph his junior season, now that he was going to be the focus of the offense. He would lead the team in scoring, but he did struggle most of the season. Joseph had a sore knee which kept him from exploding to the basket, and without Wes Johnson and Andy Rautins to draw defenders and open up the lane, Joseph found defenses very hard to beat. Joseph did improve his three point shooting. Joseph was the silent leader on the team his senior year. He and his classmate Scoop Jardine swallowed their egos and played team oriented basketball, allowing the team to share the ball and expand use of the roster. Joseph would still lead the team in scoring, though his average was down slightly from his junior season. Joseph had a solid season as was recognized for his outstanding efforts by being named to the First Team All Big East Team. He would struggle to score down the stretch of the season, and that would carry over into the post season, both in the Big East Tournament and NCAA. He would unfortunately not find his shooting touch before the season would end. He would finish his career at Syracuse as the winningnest player in school history with 119 victories in his four years. Joseph was selected in the 2nd round of the 2012 NBA draft by the Boston Celtics with the 51st overall pick. He would play a few games with the Celtics before they sent him down to the D-League. In order to save cap space on their roster, the Celtics would eventually cut Joseph. He would get picked up by the Brooklyn Nets at the end of his rookie season and play four games with them. Joseph would play in the French basketball league from 2013-2016. In 2018 he played in the Canadian basketball league.